When Do I Start to Plan My Move? How Do I Plan a Green Move? * What are the Dates planned so far for your office move? * Is there a chance the dates may change? * Do you have a 2nd and/or 3rd choice for your moving dates? * Are there any Time Restraints for your move in regards to your downtime? How soon/quickly does your move need to be made? * Do Cubicles/Partitions need to be Moved by moving company? * Will Wall Hangings and other items such as CPU and Monitors be moved by moving company? * Does Furniture need to be dissembled or reassembled by moving company? * Do you need Packing (General shared space vs. Personal packing on individuals’ desks)? * Are there any 3rd Parties involved in your move? * Do you need a Phone Technician? * Is Elevator Padding needed? * Is Floor protection necessary(ie., Masonite, etc.)? * Are there any building Time Constraints (after hours/weekends moving only)? Decide where you want all of your belonging to be placed in your new location and that it will all fit. Simple floor plans can help you with your decisions and your mover during move-in (although not necessary). Tour your home with a note pad and pen and decide which of your belonging are moving to your new location and which not. Decide which household articles you need the moving company to pack for you and which you can pack by yourself into boxes. Make a list of the household furniture and items that you do ‘not’ want the moving company to move. Make a list of the items you want to have hauled away (seeResource Page for Green Hauler). Make a list of the items you want to sell. Now it’s time to find a green, licensed and insured moving company…You can start by calling Moving Mountain Logistics: 415-382-8826…Have them put your name into their schedule book to hold a tentative spot with no obligations until you have agreed to the estimate content and you are ready to confirm…Yes, we move on Weekends and Holidays! Make any necessary travel arrangements. Arrange time off work…You can always go back. Arrange to close or transfer all your financial and/or service accounts (phone, cable, paper, mail, etc.) to your new location. Notify family, friends, and third party service providers before your move and ask for plenty of help…Delegate tasks to family members and your friends. Start to pack the items that you can pack by yourself beginning with your household goods that you will not need until after your move…One room, closet, or bookshelf at a time! Consolidate your garage items, one corner at a time! Label your boxes clearly on the ‘end’ of the box so that you can read the box contents when stacked. Clean and dust any items time permitting, before you pack them into the moving box. Make arrangements for pet transport and/or boarding if necessary. Separate the items that you want to move yourself (pictures, lamps, sentimental items, jewelry, etc.) and/or those items that the moving company cannot move (gas, flammables, etc.). Call your renters or homeowners insurance to find out what they will cover (insurance as our clients refer to it) in terms of loss/damage on a move done by a professional moving company. Schedule, or have the moving company, schedule temporary parking permits if necessary with the local law enforcement. Receive and understand all building requirements at your move-out or move-in location if applicable. Be sure to forward any pertinent information to your moving company from your building manager. Buildings commonly require liability and/or worker’s compensation insurance certificates from moving companies. Schedule the Cable Guy and other 3rd party service providers (phone, plumber, designer, etc.) for the day after your move whenever possible. If not, we understand and will work around anyone. If you are moving out of storage, make sure to finalize your move-out procedures and finances with the storage management. Stop watering your outdoor plants if at all possible (less mess, and less heavy for the moving crew). Make sure that everything is packed and sealed in taped boxes, except those items you still need to use before you are moving (coffee maker, coffee, tea, cup(s), toothbrush, TV). Label furniture and/or boxes (with ‘blue painters tape’ or 3M Tape for example), the items that you do NOT want the movers to move. Finish arranging your personal moving logistics with your family and moving company. Confirm with the moving company the date and time of your move, and the kind of coverage you want for your goods. Arrange any special parking for yourself and/or the moving trucks. Place your checkbook, cell phone, datebook, and/or any pertinent mail that you may need on moving day aside. If you are moving into storage, make sure you know the hours, your unit number, and have a lock/key for your unit. Please sign the moving contract that the head mover presents to you after the moving company arrives. Read the contract before you sign it and ask the gentleman to explain anything that you do not understand. Take the moving crew on a tour and show them what they need to move and not move. Inform the head mover if you need floor protection laid down anywhere. Make sure that you have a copy of the contract before your move begins. Designate a family member or friend to pack and load the cooler with refrigerated items. Check your house, closets, attics, basements, outside, plants, sheds, etc. (at least 3 xs before leaving) and make sure that all your household goods are on the moving truck that you want moved that day. Review with the head mover the estimated time of arrival at your final destination (commonly after a lunch break). Make sure he/she has your contact information and you have theirs if necessary. Eat and drink something (non-alcoholic for now is best); even if you are ‘not’ hungry…you will be glad you did later. Make sure to secure parking for you and/or moving company trucks. After the movers arrive at your final destination, show the crew where you want your household goods to be placed. Station yourself or designate family member or friend that knows where things go near the truck while it is being offloaded. Before the moving crew leaves, make sure you have your items placed where you want them and boxes are in the correct rooms. You may tip the movers, as it is customary in the industry but certainly not mandatory. Gratuity is graciously accepted. Thank you! Enjoy your housewarming gift…a delicious cheesecake from Sweet Cheeses! In return for accomplishing just ONE item from the green checklist below, we will offer you a FREE GIFT after your move-in! Have a YARD SALE for unwanted items. Or sell on EBAY. Or SALVAGE. If there is no time for a yard sale, DONATE unwanted items to local donation centers (from sofas to beds to office supplies and kitchenware). Thanks for keeping these things out of the dump. Sausalito: Women Helping All People 339-9423, Novato: Goodwill, San Rafael: St. Vincent’s. 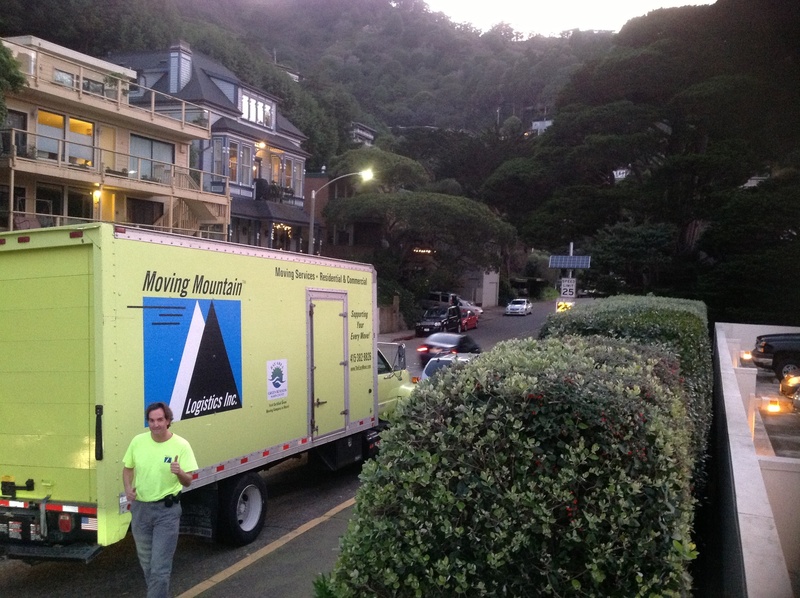 Moving Mountain can help with delivery for you as well. Or… Find your local branch here. POST items for FREE at www.freecycle.com orwww.craigslist.com. Use GREEN HAULING services for your estate fromwww.ireuse.com. Order ‘PRECYCLED’ BOXES from Bay Area Box Express,www.bayareaboxexpress.com. 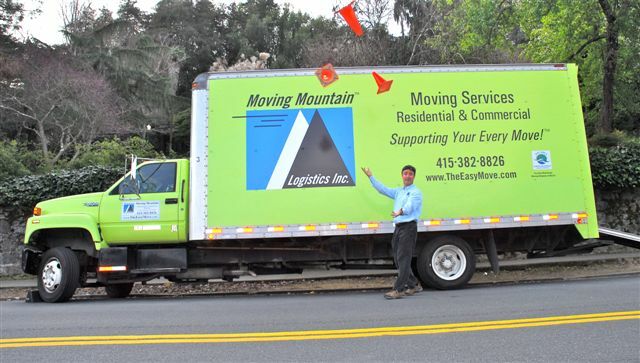 CALL Moving Mountain for pick-up of your broken down uniform moving boxes. Thanks for being a part of Marin County’s grass roots campaign to promote green business!